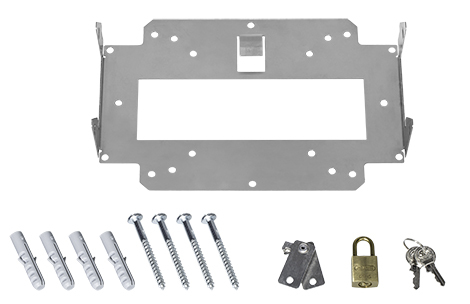 The LANCOM Wall Mount (LN) consists of one wall bracket with kensington lock, one padlock, and one drilling template. It offers optimal anti-theft protection for LANCOM devices in LN housing and maximum flexibility for the installation of access points at walls or ceilings. The pre-drilled mounting board can be fixed directly at the wall and has four hooks, which the access point in LN housing can be easily clipped into. Additional security feature: In order to remove the device, a screwdriver is needed, which pushes the hooks back. The LANCOM Wall Mount (LN) safeguards LANCOM devices in LN housing with the help of a 4-times kensington lock. Therefore, LANCOM access points can be securely installed even at places with a high visitor-density. The included padlock assures that the kensington lock is easily and reliably secured. The attached drilling template is compatible to that of the LANCOM Wall Mount. This way one can use the drilling holes and the already implemented screws for the mounting of the LANCOM Wall Mount (LN). This saves additional effort and time.